In this study, we isolated the S. algae ACCC strain from human bile and performed whole genome sequencing. S. algae ACCC consists of a circular 4,743,354-bp chromosome with a GC content of 53.08%, within 4080 protein coding sequences. The genome of strain ACCC contains a number of candidate genes which have been reported to be associated with bile adaption, including htpB, exbBD, wecA, galU, adeFGH and phoPQ regulon. Our results highlight the association of S. algae with a rare disease profile. Further studies are needed to shed light on the evolution of pathogenesis and the niche adaptation of S. algae. Shewanella algae was first described in 1992 from various clinical samples in Japan . Since then, the organism has been identified in aquatic ecosystems worldwide . Studies have also suggested that it thrives in a wide-range of temperatures and sanities . The manifestations of S. algae in human infections are protean; although sepsis, intra-abdominal infections, and soft tissue infections are present in the majority of cases . The hepatobiliary tree is one of the most common sites of isolation and a major source of blood stream infection [2, 4]. Reports in Asia have further demonstrated hepatobiliary disease as an important risk factor for shewanellosis . There are very few studies which have examined the pathogenicity of S. algae. Its ability for bile salt adaption is likely to be an important factor for its survival and subsequent infection of the hepatobiliary tract. Whole genome sequencing provides opportunities to address the issue . Currently, there are 12 genomes of S. algae accessible on NCBI databases (two clinical isolates from respiratory tract and soft tissue and ten environmental isolates). Here, we report the first whole genome sequence of bile-isolated S. algae ACCC. The S. algae ACCC was isolated from a bile sample of a cholangitis patient and resistant to 5% ox-bile salts. The strain was identified as S. algae by the matrix-assisted laser desorption/ionization time-of-flight mass spectrometry (MALDI-TOF MS) technique, along with 16S rRNA sequencing. The primers used for amplification of the 16S rRNA gene were B27F (5′-AGAGTTTGATCCTGGCTCAG-3′) and U1492R (5′-GGTTACCTTGTTACGACTT-3′). The PCR products were subsequently sequenced and compared with the 16S rRNA bacteria sequence database on the NCBI using BLASTn (optimized for megablast) search algorithm . The bacterial genomic DNA was extracted from overnight culture of the S. algae ACCC using the QIAGEN Genomic-tip 100/G kit and Genomic DNA Buffer Set (QIAGEN, Valencia, CA) according to the manufacturer’s instructions. Qubit dsDNA HS Assay kit and Qubit 2.0 fluorometer (Life Technologies) were used to measure DNA concentration. A total of 2 µg of each DNA sample was used to build indexed PCR-free libraries, using a multiplexed high-throughput sequencing TruSeq DNA Sample Preparation Kit (Illumina, San Diego, CA) according to the manufacturer’s protocols with minor modifications. The genomic DNA was subjected to whole genome sequencing on an Illumina MiSeq sequencer using the paired-end 2 × 250 bp sequencing protocol and generated 2,927,608 reads. The total read depth was 186-fold coverage, with a mean read length of 301 bp. Read data was filtered using duk (http://duk.sourceforge.net/) (ktrim = r k = 23 mink = 11 hdist = 1). Low quality (Q-score < 10) reads are trimmed and a read is retained if at least 50 bp by FASTQX-toolkit (https://github.com/agordon/fastx_toolkit). Sequencing data were assembled using Velvet v. 1.2.07 and ALLPATHS v. R46652 using 31 bp k-mer size (https://github.com/agordon/fastx_toolkit). Sequencing data were assembled using Velvet v. 1.2.07 and ALLPATHS v. R46652. The annotation of the S. algae ACCC was performed using the National Center for Biotechnology Information (NCBI) Prokaryotic Genomes Automatic Annotation Pipeline (PGAAP), in which the prediction was carried out using Glimmer 3.02 . The non-translated genes were predicted using tRNAScan-SE , RNAmmer , and RFAM . Functional classification of the predicted genes was performed using RPSBLAST program v. 2.2.15  in conjunction with the COGs (Clusters of Orthologous Groups of proteins) databases using an E-value threshold < 0.001. The candidate virulence genes in S. algae ACCC, MARS14, and C6G3 genomes were separately identified using the Virulence Factors Database (VFDB) . The assembled genome is first aligned against VFDB protein sequences of the full dataset (Set B) using BLASTX under the following criteria: identity > 45%, aligned length > 450 bp, alignment coverage > 95% and E-value < 1e−45. If multiple virulence factor genes are overlapped at the same locus in the genome, only the best-aligned virulence factor gene is retained. The ACCC-specific virulence genes were further extracted by excluding those also found in MARS14 and C6G3. In addition, putative antibiotic resistance genes in ACCC strain and public available clinical S. algae genomes (MARS 14 and YHL) were predicted using ResFinder 3.0 . We used OrhoANI to compute the ANI values , which has 254 citations, because whole-genome ANI now becomes the standard for species identification/confirmation by NCBI during genome submission. The OrthoANI reconstructs the phylogeny in different ways. First, the genome is chopped into pieces of 1020 bp and BLAST is used to compute the ANI of all homologous pairs. Finally, UPGMA is invoked to cluster the species using the ANI as distance metric. In order to further confirm the whole-genome phylogenetic accuracy of OrthoANI, we also reconstruct whole genome phylogeny independently using REALPHY , which is based on PhyML to infer the whole-genome phylogeny using maximum likelihood. Genomic DNA used for sequencing was purified from a pure culture taken from a single colony of the S. algae ACCC strain. The bacterium was identified as S. algae by both biochemical identification and the MALDI-TOF MS technique. The 16S rRNA gene was sequenced and BLAST was performed against the NCBI database, which revealed no potential contamination of the genomic library. The raw read data was filtered using duk, and quality trimmed with FASTQX-toolkit fastqTrimmer. The final assembled genome consisted of 74 scaffolds with a total size equal to 4,743,354 bp, with a mean G + C content of 53.08%. An illustration of the genomic contents in the genome of ACCC is shown in Fig. 1. The maximum contig size was equal to 589,495 bp, and the N50 size equal to 118,224 bp. The gene annotation included 4080 protein coding sequences (CDSs), 91 tRNA genes and 8 rRNA genes (Additional file 1: Table S1). The distribution of genes into COGs functional categories is shown in Additional file 2: Table S2. No extrachromosomal elements were detected in ACCC. Sequencing of the 16S rRNA gene and a subsequent BLAST-search confirmed the taxonomic status of S. algae ACCC (Additional file 3: Figure S1). To further elucidate the phylogenetic relationships, whole genome DNA-sequence-based average nucleotide index analysis was performed and phylogenetic trees were constructed. The dendrogram illustrates that ACCC strain was most closely-related to C6G3 and MARS14, sharing an ANI > 98% (Fig. 2). Independent analysis of Whole-genome phylogeny using REALPHY  also confirmed the phylogenetic position of ACCC is indeed most closely-related to C6G2 and MARS14 (Additional file 4: Figure S2). 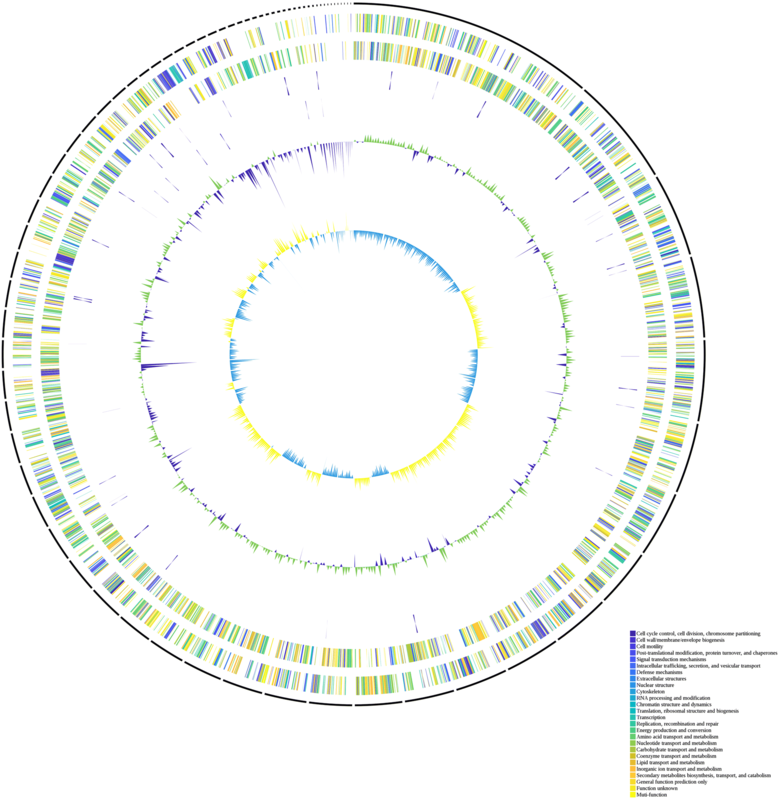 Further screening of the S. algae ACCC genome for putative virulence-associated genes was conducted by aligning ORF encoded protein sequences to the virulence factor database. Comparative analysis of ACCC, clinical isolated MARS 14, and environmental isolated C6G2 revealed strain specific genes mshB which is associated with MSHA type IV pilus biogenesis. S. algae ACCC also contains conservative heat shock protein genes clpC, clpE, and clpP. In addition, the histidine kinase gene cheA-2 was detected and the gene was demonstrated to be essential for chemotaxis . We also predicted blaOXA-55 in all tested genomes. The clinical significance of this finding warrants further investigation. Bile salts possess potent antimicrobial activity via damage membranes and DNA. To survive in bile and subsequently cause biliary tract infections, bacteria must have intrinsic resistance mechanisms to contend with bile stress . Genomic analysis of S. algae ACCC showed the presence of numerous genes which may determine its bile resistance properties, supporting this strain’s pathogenicity in causing cholecystitis. Comparative genomic analysis identified the presence of htpB in ACCC but not in clinical isolated MARS 14. htpB encoding chaperonin, which has been reported to implicate in bacteria response to bile . We also predicted conservative genes associated with bile adaption. S. algae ACCC possessed exbBD encoding Ton energy transduction system implicated in the response to bile . We also detected phoPQ regulon, galU, and wecA involved in bile resistance . The gene encoding bile-inducible molecular chaperone DnaK was also identified . The resistance-nodulation-cell division family members have been associated with tolerance to bile salts, multidrug resistance and biofilm formation . Analysis of the genome of strain ACCC revealed the existence of genes encoding resistance-nodulation-cell division pump AdeFGH. Further studies are required to verify its genetic properties, along with the virulence potential, evolution traits for its zoonotic properties and spreading capabilities. JC, YH and PL proposed this work. ST, KT, ZW collected samples, performed experiments. SC, YH, PL analyzed data, wrote first draft of manuscript. YH, PL, KT reviewed and edited manuscript. YH and PL have critically edited the revised version of manuscript. All authors read and approved the final manuscript. We would like to take this opportunity to thank Dr. Lee Pan for his support in Kyoto and Osaka. The genome sequence of Shewanella algae ACCC has been deposited in DDBJ/EMBL/GenBank under Project Accession Number LVCY00000000. The version described in work is version LVCY00000000.1. We are grateful to Taiwan’s Ministry of Science and Technology (MOST) and Taichung Veterans General Hospital for funding. YTH was supported in part by a Grant (106-2221-E-194-056-MY3) from Taiwan’s Ministry of Science and Technology (MOST). PYL was supported by Grant (TCVGH-1073901B) from Taichung Veterans General Hospital. 13099_2018_267_MOESM1_ESM.docx Additional file 1: Table S1. General features of S. algae ACCC genome. 13099_2018_267_MOESM2_ESM.docx Additional file 2: Table S2. COG functional categories of S. algae ACCC genome. 13099_2018_267_MOESM3_ESM.docx Additional file 3: Figure S1. Phylogenetic tree based on 16S rRNA gene sequences showing the phylogenetic position of Shewanella algae ACCC. 13099_2018_267_MOESM4_ESM.docx Additional file 4: Figure S2. 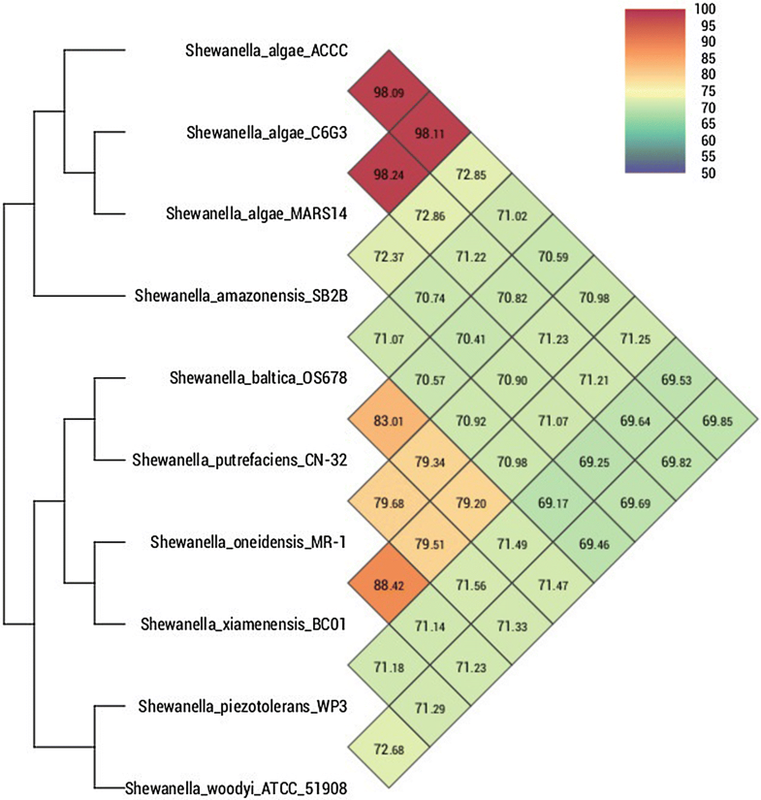 Phylogenetic tree based on whole-genome sequences showing the phylogenetic position of Shewanella algae ACCC.